Home » Hindu Warrior in armor, 15th century. 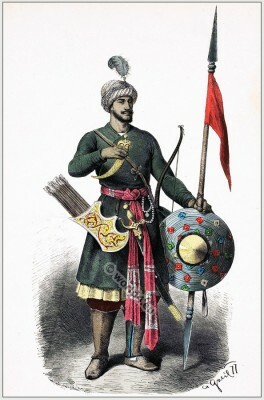 Medieval Hindu Warrior in armor, 15th century. Equipped with bow and arrow, dagger, sword, shield and spear. Sheets for costume design. Published by Franz Lipperheide, Germany. This entry was posted in 1450, 15th Century, Asia, India, Middle Ages, Military and tagged India military uniforms, Lipperheide, Traditional India costumes on 5/28/13 by world4.